Well, it has been awhile since I have updated this blog and for that I’m sorry. I have been deeply involved in a book and photo project called Uplift for the Uplift Organization. My wife is writing and we are trying to capture the stories of the homeless in Kansas City. I want to put a face on this issue. We have been making great progress. This project will commemorate Uplift’s 20th anniversary and take place sometime in March of 2011. The location will be Cafe Trio. That may seem like a long time from now but not to me. I plan a full photo exhibition with a book to go with it and small portfolios too. All will be for sale to benefit Project Uplifit. From all this my wife and I will seek publication of a broader book. I’m the kind of person who loves to run over and show you my latest picture but in this case no one will see them except for Patti and me as we work on this project. 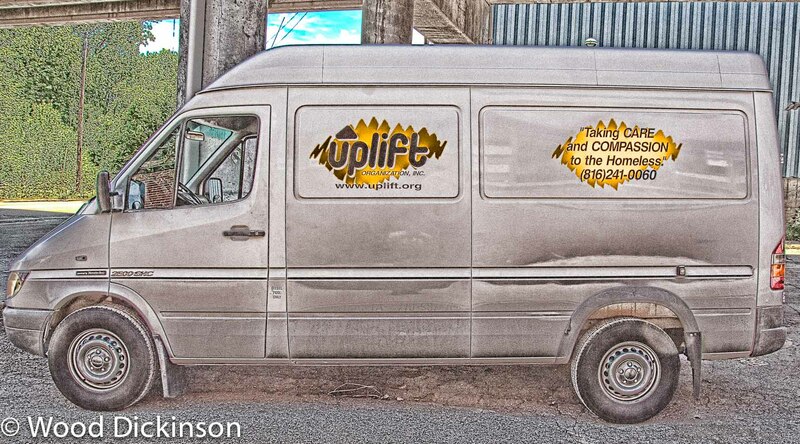 I did include here a photo of one of the Uplift vans. To learn more about Uplift click HERE. Printing is an issue I have been struggling with for sure. I can make great prints up to super B size but that’s as large as I can go. I am investigating options here in the US. I have some companies I’ve used in the passed for specialty printing (posters, canvas prints) but these need to be exhibition quality and produced for that purpose. I have done some exhibitions where all the work is framed but the cost is high and the buyer will probably reframe them anyway so it is just added cost to the piece and more road blocks toward a sale. I’m sure you know all this. Any ideas or thoughts are welcome.